In his new book, “Ayurvedic Herbs: The Comprehensive Resource for Ayurvedic Healing Solutions,” Dr. Virender Sodhi illustrates how food is medicine, as practiced in the Ayurvedic tradition. “It’s the oldest form of medicine in human history,” says Dr. Sodhi, founder of the Ayurvedic and Naturopathic Medical Clinic. In fact, its pharmaceuticals that are often the primary culprit for the imbalances in our bodies, and that’s what is driving the chronic disease to skyrocketing numbers, he says. Along with a healthy lifestyle, Ayurvedic herbs can help clean blood vessels of the heart and put cancer into remission, he says. About Virender Sodhi, M.D., N.D.
Dr. Virender Sodhi was the first Ayurvedic and Naturopathic physician in the United States. 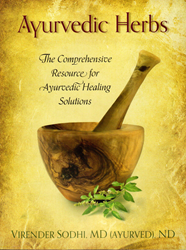 He is the author of “Ayurvedic Herbs: The Comprehensive Resource for Ayurvedic Healing Solutions,” (http://www.ayush.com) and founder of the Ayurvedic and Naturopathic Medical Clinic, (http://ayurvedicscience.com). Dr. Sodhi is adjunct faculty at Bastyr University. He earned his M.D. (Ayurved) in 1980 from the Dayanand Ayurvedic Medical College in Jalandar, India. He served as a college professor in India until 1986, when the Indian government selected him to share Ayurveda with Western society as part of a cultural exchange program. He finished his fellowship in Integrative Oncology with Dr. Mark Rosenberg in 2012. Dr. Sodhi is a visiting professor at Southwest College of Naturopathic Medicine in Scottsdale, Ariz., at the University of Washington School of Pharmacy, and at Des Moines University in Iowa.